My Friend Dahmer on digital now and DVD on 30th July. And to celebrate we have a great competition for you and 3 copies on DVD to give away. Writer-director Marc Meyers has crafted a haunting and evocative look at one of history's most notorious serial killers. 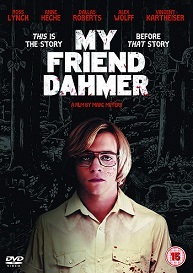 Shot on location and in Dahmer's childhood home, the film reveals his troubled family life, his increasingly bizarre attempts to make friends and his fascination with the macabre. Based on the critically acclaimed graphic novel by Jeff s classmate Derf Backderf, MY FRIEND DAHMER chronicles the origins of the man, the monster...the high school senior. Who Directs My Friend Dahmer?